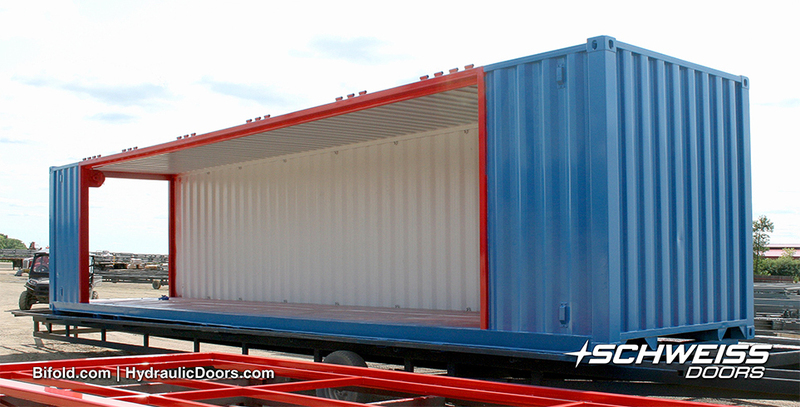 This unique 40' x 12' mobile container was designed and built by Shomotion LLC of Denver, Colorado. Inside it is a prototype fuselage of Mitsubishi’s soon to be produced 70 to 90 passenger regional jet. 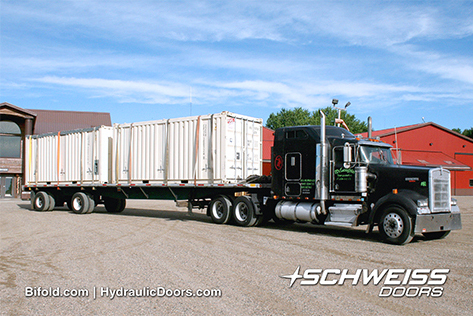 Schweiss Doors custom-built a 28' x 7' 11" hydraulic door for it. 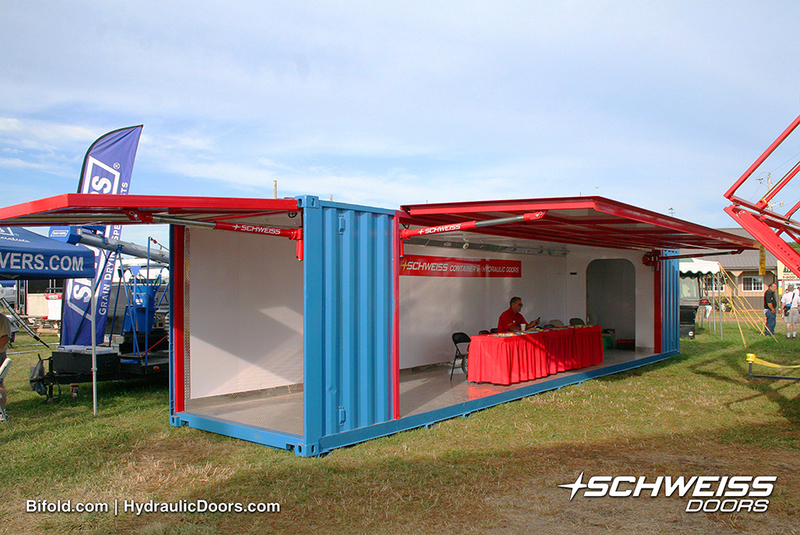 From a shipping container to a beautiful showroom at Wisconsin's Oshkosh Air Show. 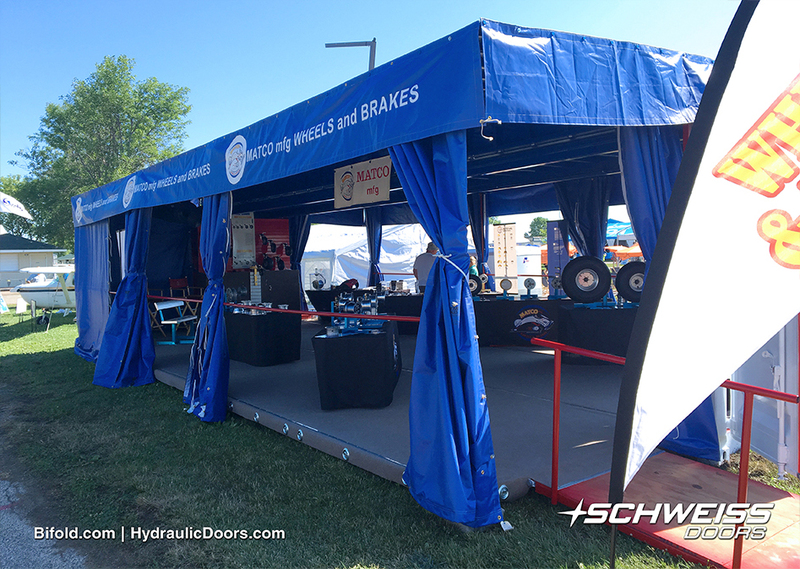 Schweiss Doors was called to the rescue and came through to iron out a container door hydraulic and electrical problem for an aircraft parts distributor bound for the Oshkosh Air Show in Wisconsin hoping to sell his wares there. MATCO Mfg. 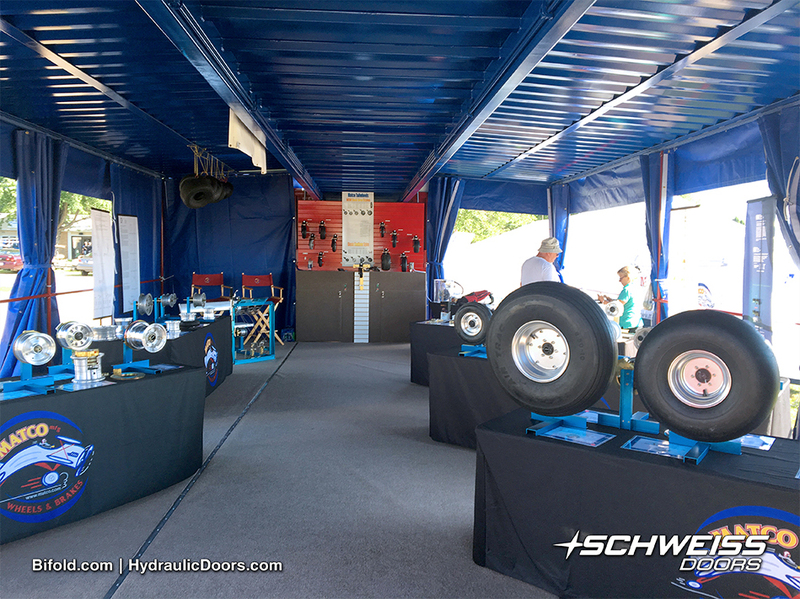 President, George Happ, whose business is headquartered in Woods Cross, Utah, recalled visiting one of the Schweiss Doors sales containers at the Oshkosh Air Show. Billed as the World’s Greatest Aviation Celebration, it brings in thousands of visitors each day and caters to pilots flying in on every aircraft imaginable to meet their needs. Exhibitors there run the gamut selling everything from nuts to bolts. MATCO Mfg. 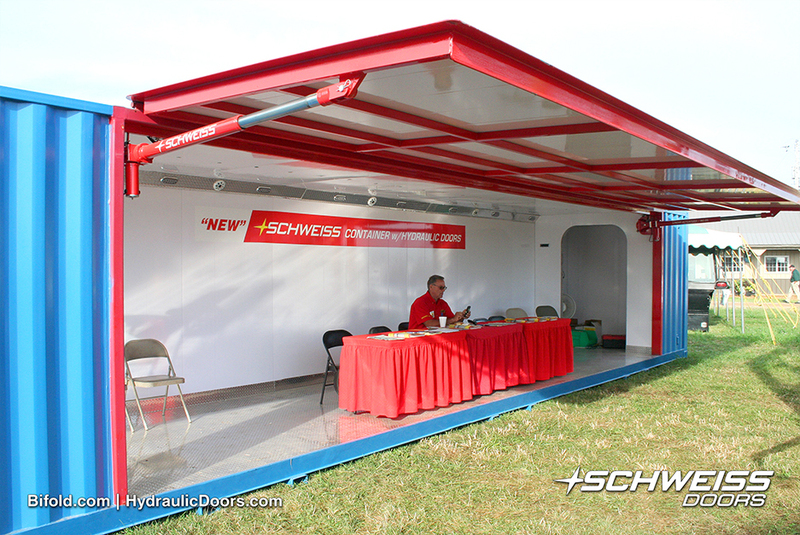 has had a sales booth there since displaying at the 2001 show. In order to improve the quality of their display, Happ settled on the idea of using a shipping container as the basis for the display. 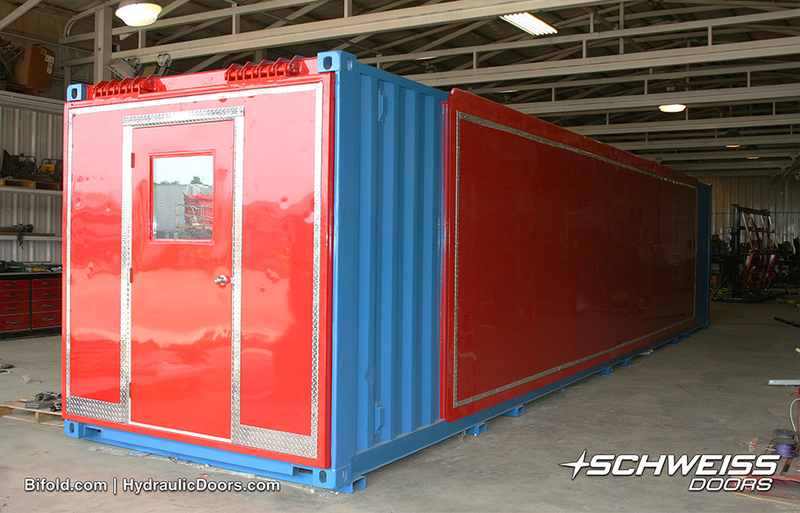 Even though single-use shipping containers are widely available in the U.S., the particular style container to be used required purchase from a Mainland China company that sells containers. 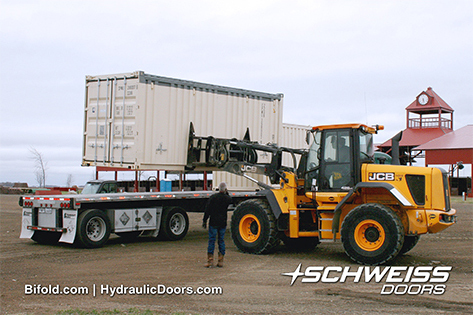 Happ needed to get the problem straightened out so he shipped the container to Schweiss Doors who discovered additional problems with the hydraulics. MATCO Mfg. Wheels & Brakes of Woods Cross, Utah ordered this container from a Chinese company only to find out there were major problems with the hydraulics and electrical. 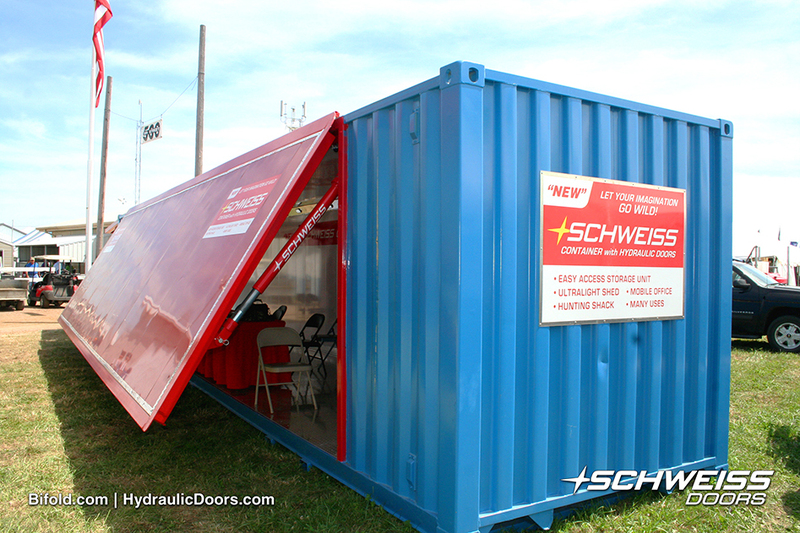 With time running out before the Oshkosh Air Show, they called on Schweiss Doors to get it working properly. 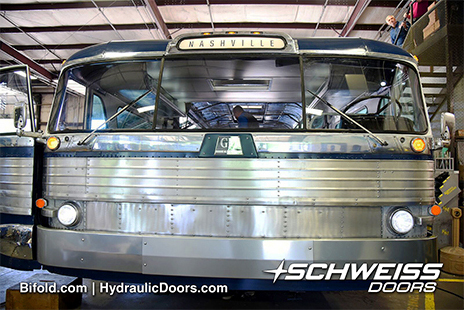 At this point, when Schweiss Doors fixed the hydraulic problem and replaced their pump with a Schweiss pump they were looking at five weeks until show time, and they still had to make one more stop at a company called Mr. Woo’s Custom By Design to complete a lot of interior finish work on the container, giving them only about a week before they needed to have it at Oshkosh. MATCO Mfg. 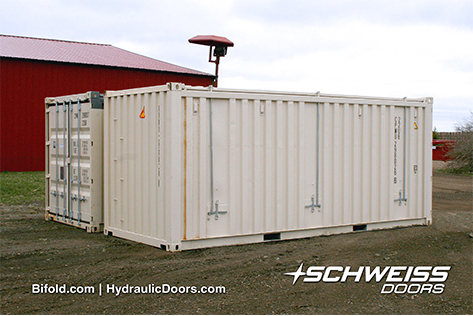 added additional flooring on each side of the container that is lowered via an electric winch. 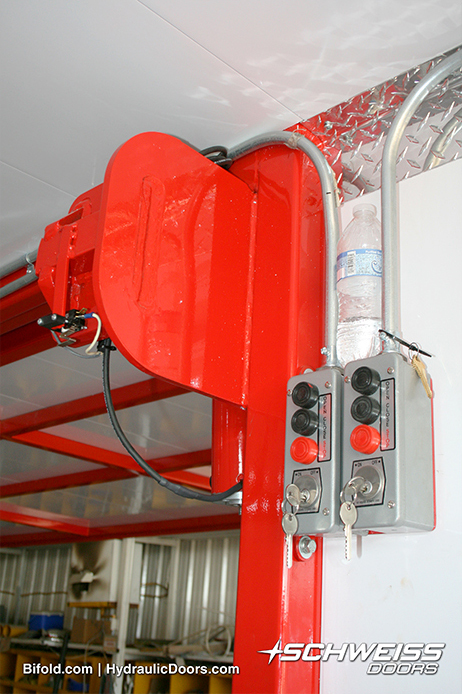 They plan to improve this system by hooking it up to the Schweiss hydraulic pump. 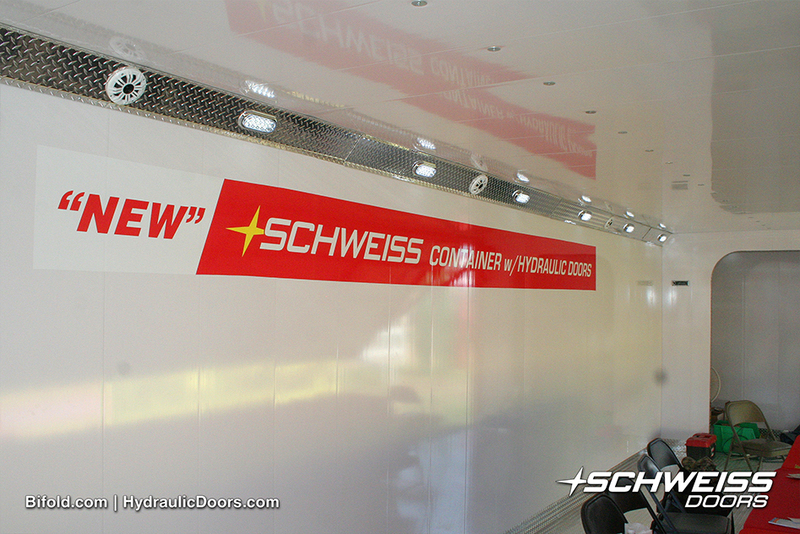 “I would heartedly recommend the Schweiss service and product to anyone - top notch, top notch! Like I said, coming into this project this year we had all kinds of trauma about this container, correcting the hydraulics, getting it ready; how we were going to get it to the show. Once I got the container to Schweiss I didn't have to worry about any of the work they were doing on it. Just from talking to Mike and the responsiveness of Mike and Jeremy handling it I knew everything was going to be taken care of, and that's exactly how it worked out,” said Happ. He noted he's had a lot of people interested in the container and said it can make sense for businesses to display out of a container. 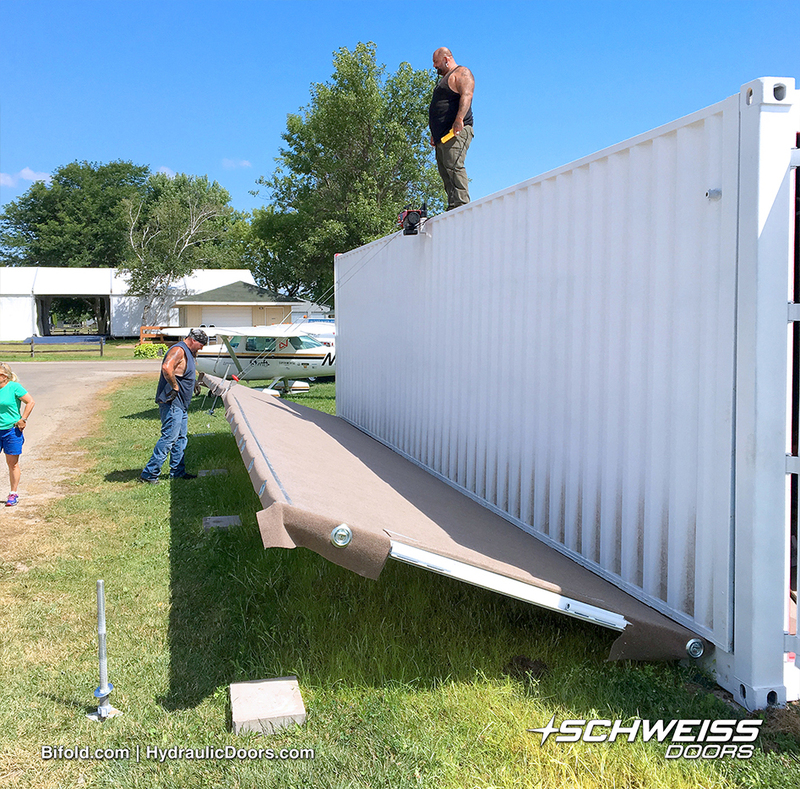 His container is 9 ft. tall and 8 ft. wide and 40 ft. long, it's width stretches to 22 ft. with the side floor extensions out to give him 800 sq. ft. of display space. 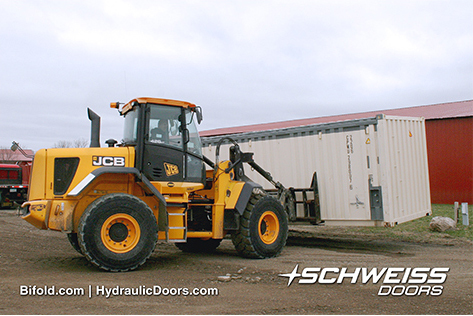 The hydraulic pump has more than enough power to lift up the heavy steel side doors and may someday be used to operate the floor extensions that currently move up and down with an electric winch. 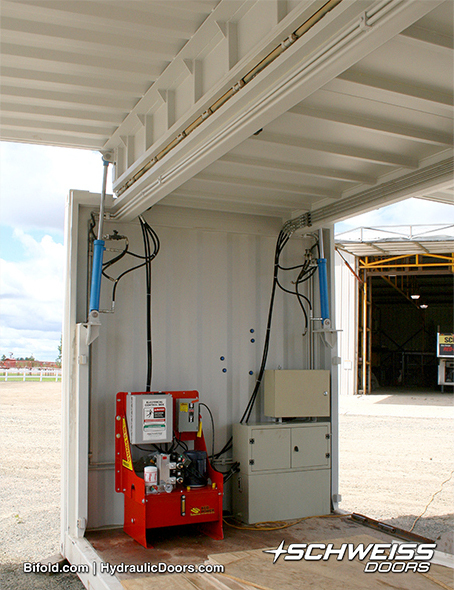 With the sides out on the MATCO container it extends to 22 ft. offering 800 sq. ft. of sales space inside. You'll also note on the MATCO Mfg. website a line that says, “SpaceShipOne Makes First Flight and Stops on MATCO Manufacturing Wheels and Brakes” - A nice endorsement to note its products have also been used for outer space travel. SpaceShipOne is a three-place, high-altitude research rocket, designed for sub-orbital flights to over 62-mile altitude. The unique configuration allows aircraft-like qualities for boost, glide, and landing. Top rocket engine speed was 2,186 mph. At its highest point, the rocket plane reached an altitude of 367,442 feet. Prior to Show Ready: The MATCO Mfg. 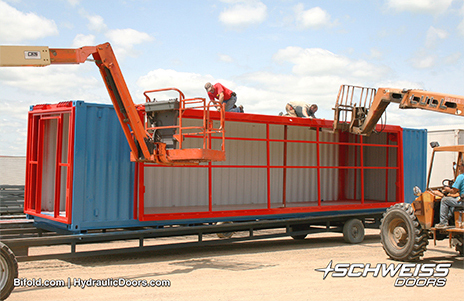 container has two hydraulic-operated doors that swing out from each side. 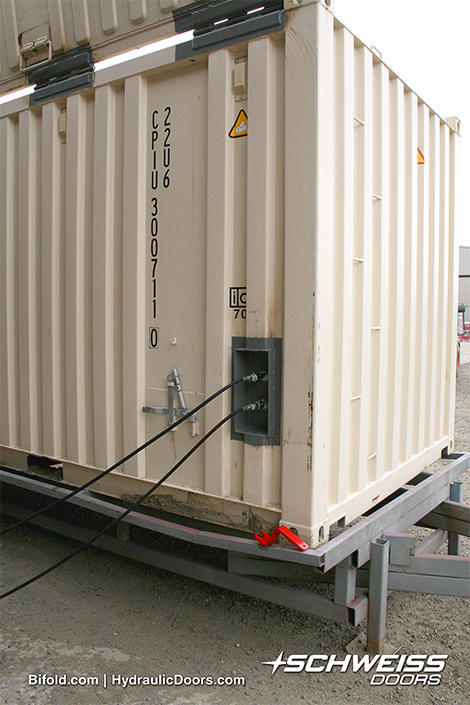 The Chinese pump that was shipped with the container arrived with the incorrect electrical system. 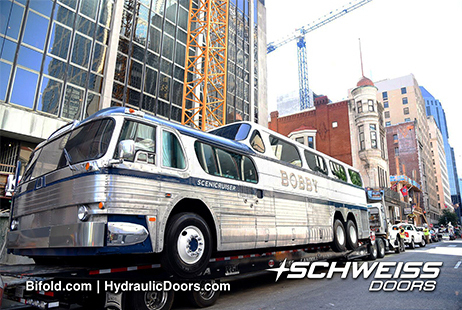 Once Schweiss Doors inspected it, they discovered the hydraulic lines were also haywire with metal lines that had been welded on fittings at high stress points. Ironic, isn't it? 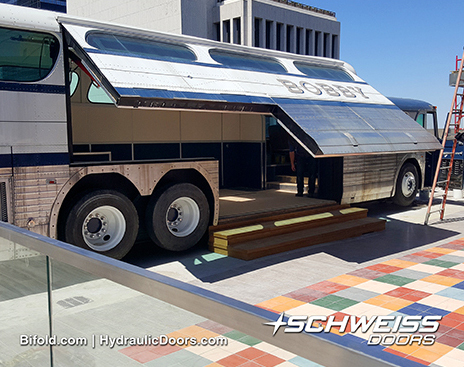 Schweiss Doors has also had a part in space travel. 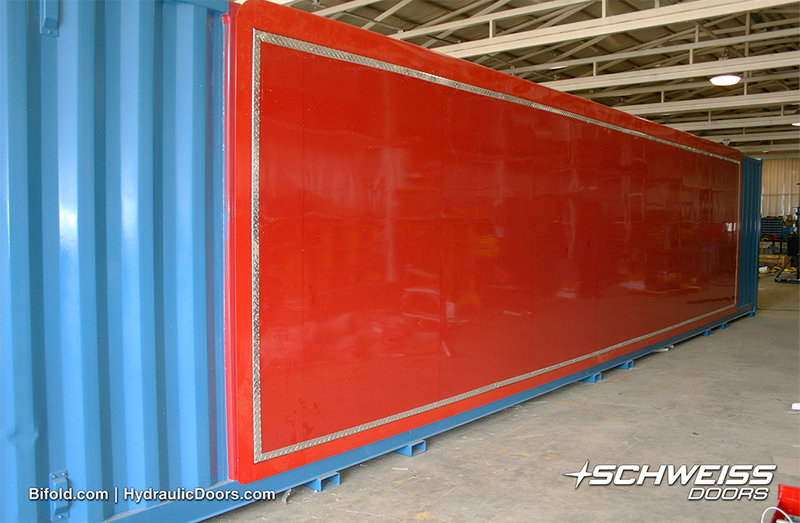 Its largest 90 ft. wide x 61 ft. tall bifold liftstrap door is on a rocket hangar at Cape Canaveral. 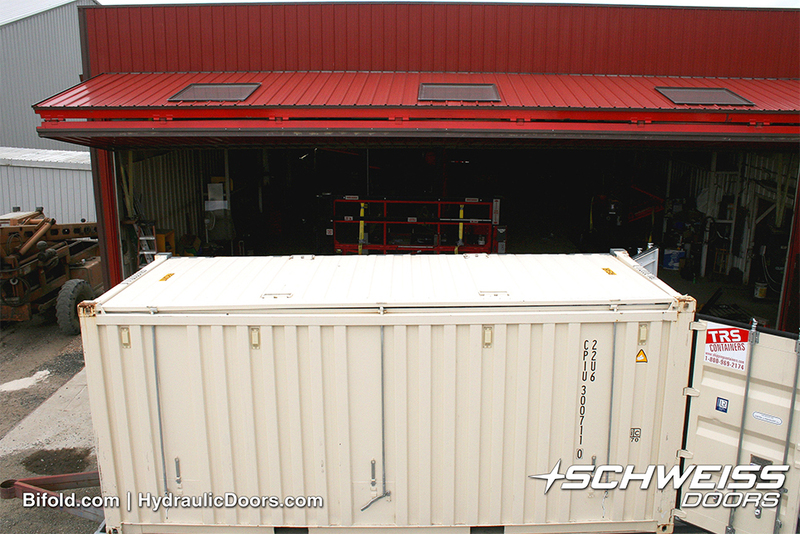 The unfinished container was sent to the Schweiss factory where work was done to alleviate the hydraulic problems by replacing the pump and lines. 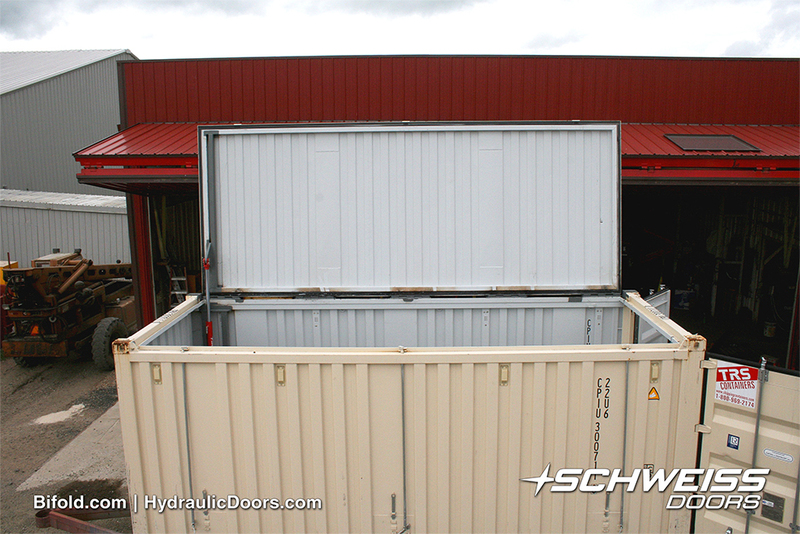 After this, the container was shipped to another location to make it presentable inside and where a cabinet was built to enclose the Schweiss pump. Wheels and brakes were supplied by MATCO Mfg. 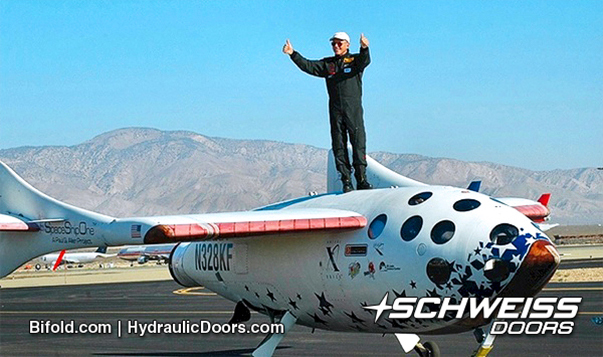 for SpaceShipOne; the first private manned space vehicle. Here one of its crew celebrates after returning to earth in 2004. "New" Let Your Imagination Run Wild! 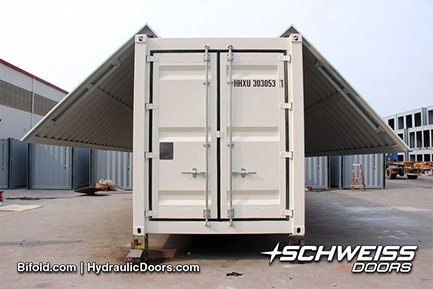 A Schweiss hydraulic door can open up the side of your container, whether it is used for storage or show, to make it more accessible from one end to the other. 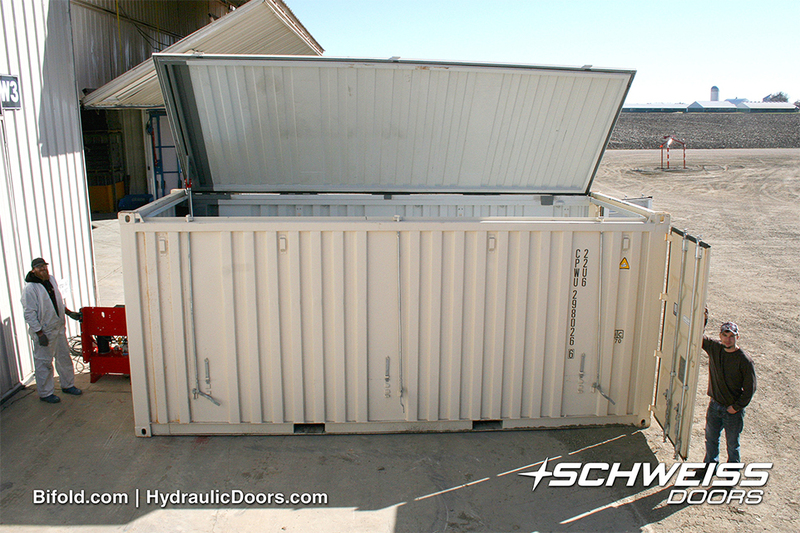 Containers with hydraulic doors open up the entire side of your container. 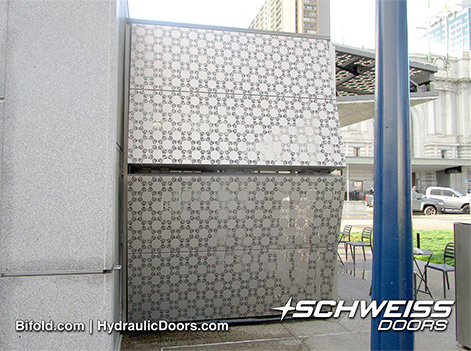 New Schweiss interlocking insulation panels give the inside of your doors a nice clean look. 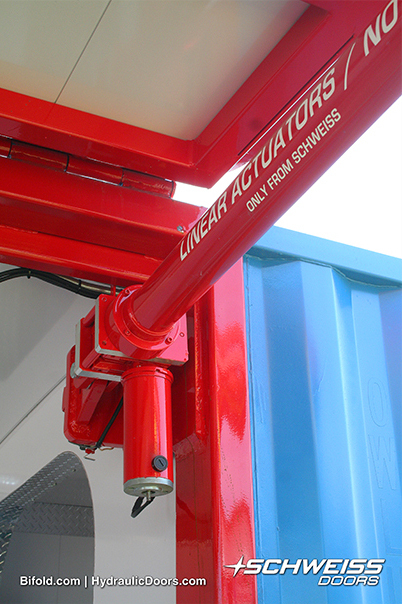 Strong, specially made ball screw electric Linear Actuators require no oil and open and close the door. A strong motor gives each cylinder a lifting power of 5,000 lbs. 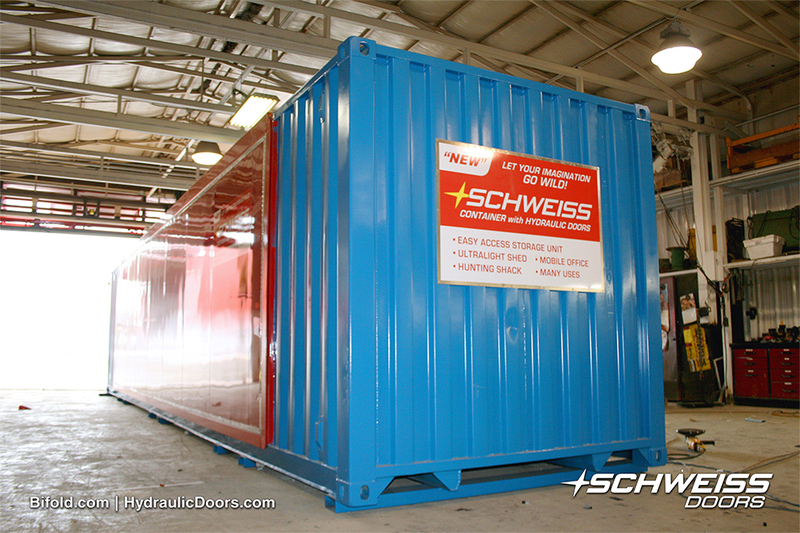 If you need a really easy access storage unit, Schweiss Doors has the answer. 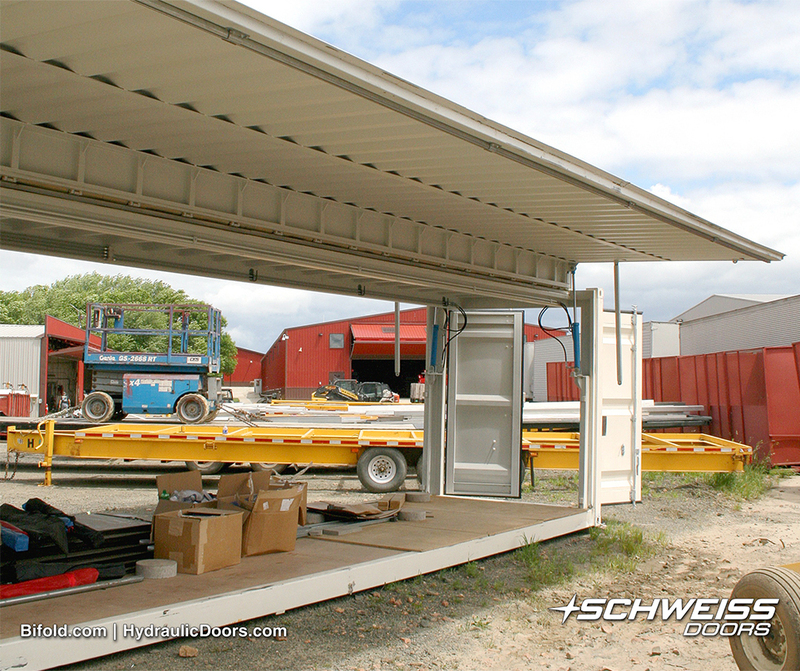 These newly designed Schweiss containers are perfect for a number of uses such as safe and secure portable sheds, workshops, a mobile office, storage for farm seed and chemicals, hunting shack, band stage, food and beverage stands; it can be used for most anything you can imagine. 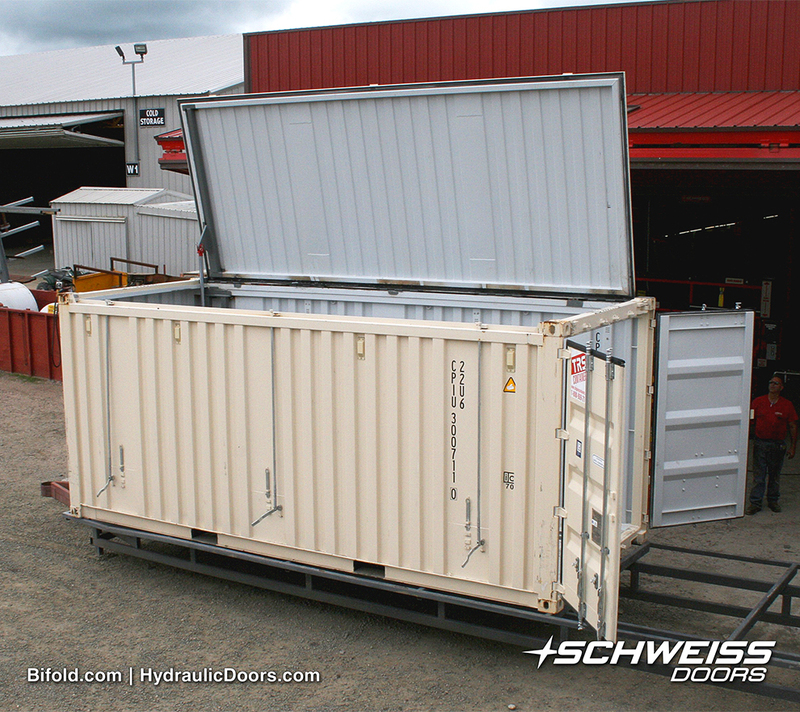 Custom-built from the bottom up, the new Schweiss Container with hydraulic doors and specially designed cylinders for Schweiss Doors only, is unlike any other container opening system you'll run across, and it's portable. "Accessibility is what drove this," said Mike Schweiss. "As you drive through the countryside you'll often see unsightly temporary storage units such as empty semi trailers or shipping containers sitting in backyards or beside the road as a result of factories overrun with places to store them. Everybody has a real common problem with these as they can only be entered from the back. Now, when you stack it full, how do you get to the front? It's almost impossible. 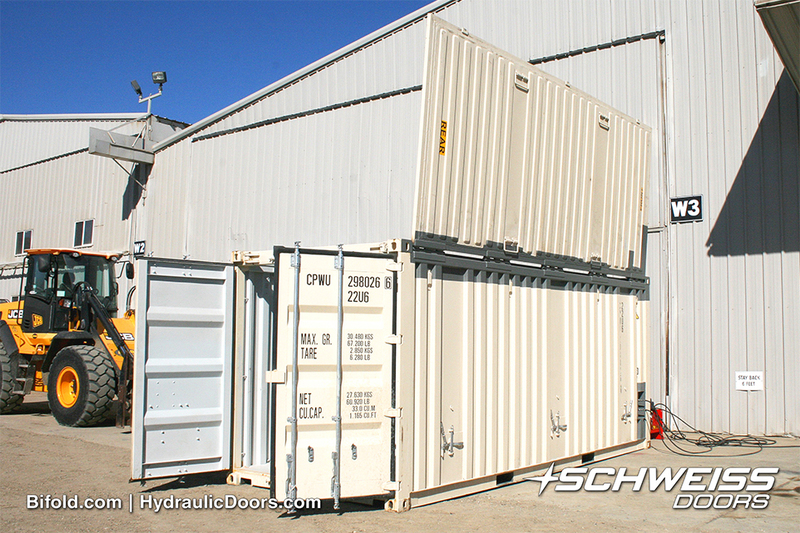 The beauty of this is the large side door that opens up the entire container changing the way people will store their things. 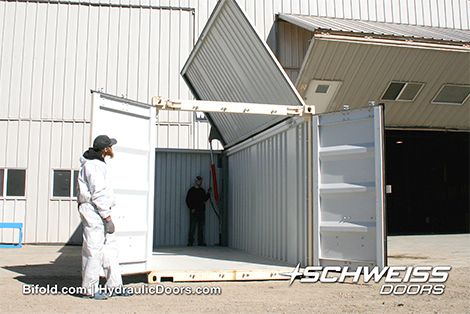 It's a much more friendly option," said Mike Schweiss, CEO of Schweiss Doors. What makes it different? 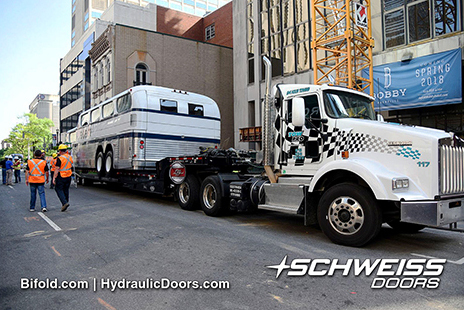 The major difference is in the powerful hydraulic door system. 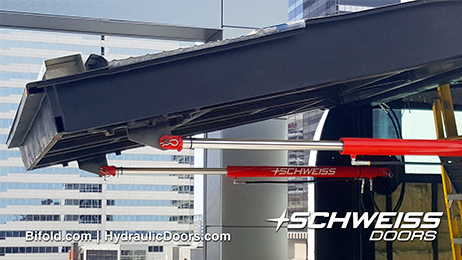 The "green doors" use powerful cylinders just like any Schweiss Hydraulic Door. But these cylinders are not activated with a compact electric power pump or hydraulic fluid or oil lines and the like. 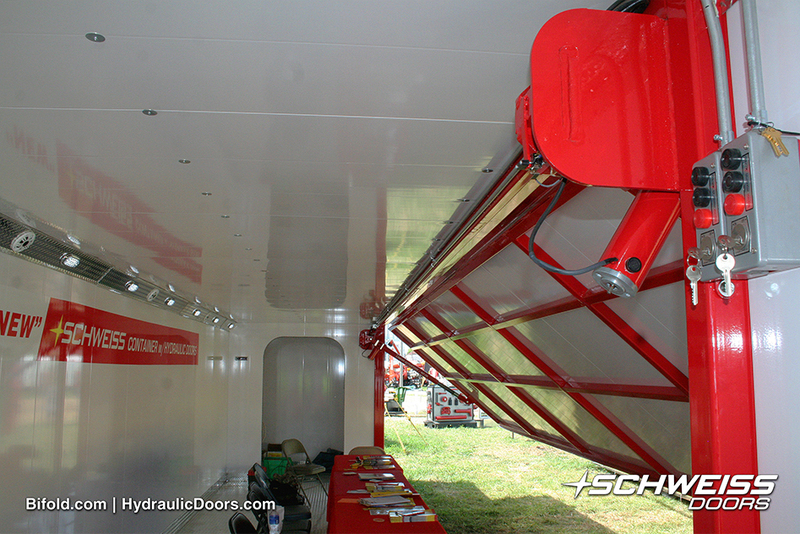 Attached to the top side of each specially designed container door cylinder, is a motor that is rated to lift 5,000 lbs. from each cylinder and a ball screw actuator, the same type used on vehicle power steering units. The DC drive utilizes a 110 volt AC power supply. 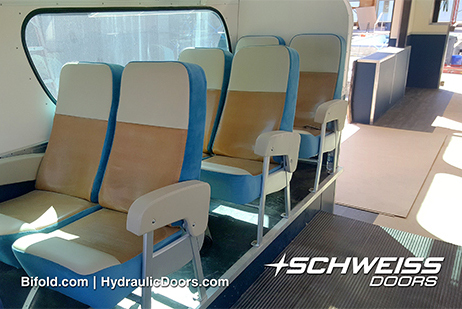 Each cylinder has a limit switch which stops the movement of the door when it reaches the wide open or closed levels of travel. 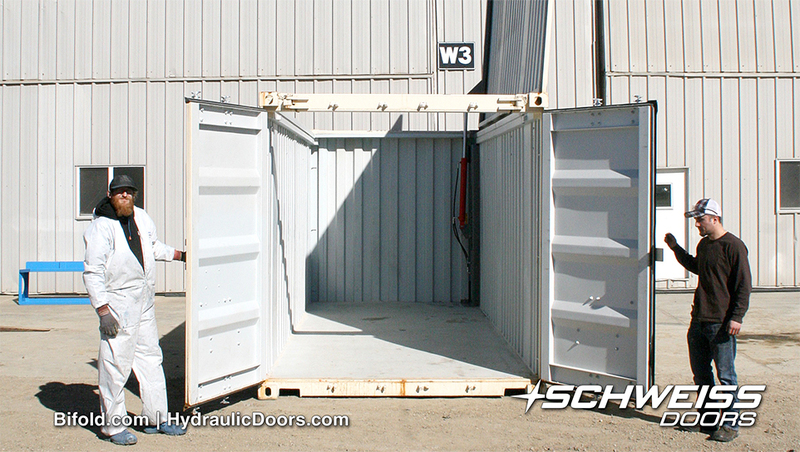 The walls inside the container are lined with 1 1/2" insulation coated with 3/8" corrugated plastic for a R-Value 14. There's more - safety is always a big factor. The linear activated 90:1 ratio worm drive enhanced safety feature keeps the door from running backwards and closing if there is no power going to it or until you activate your door panel open/close button or your remote control. 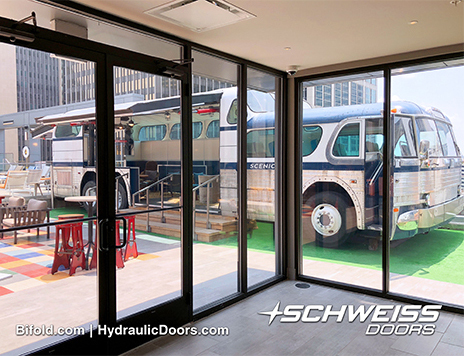 These weathertight doors can also be equipped with photo eye sensors, door base safety edges, warning horns and lights, windows or other accessories. 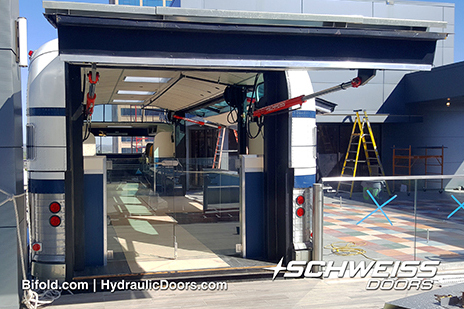 When the hydraulic container doors are open they provide a nice shaded canopy that opens to the entire container for easy accessibility. 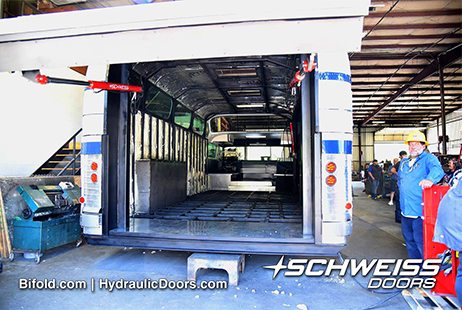 Doors are constructed with 2" x 2" strong steel tubing with a built-in truss system for added strength. 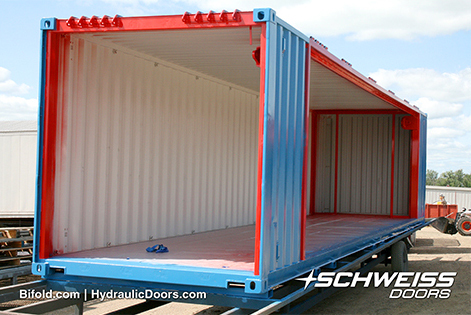 Containers have 1½" insulation coated with &frac38;" corrugated plastic giving an R-Value of 14. 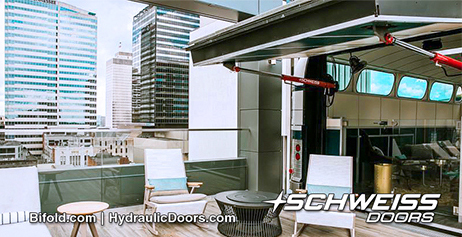 There is no need to lubricate the big side door heavy duty hinges because they have maintenance-free nylon wear-resistant bushings and removable hinge pins. 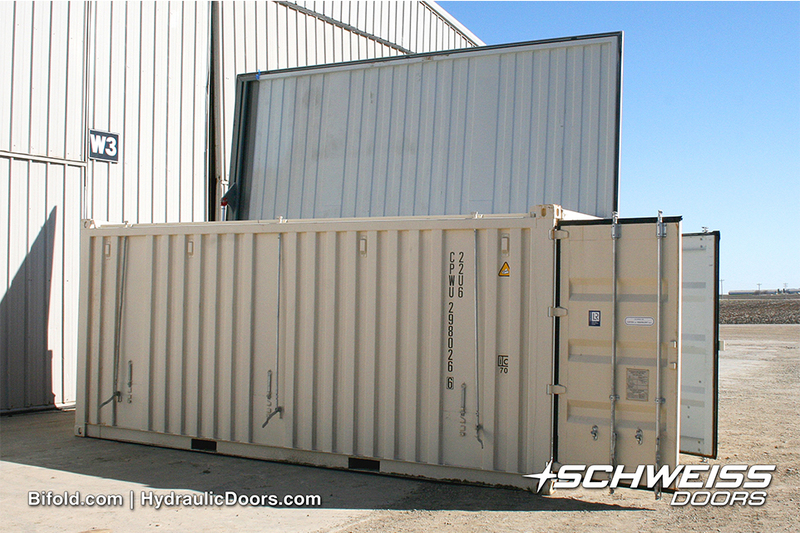 The hinges are not visible from the outside when the door is closed, giving the container a nice clean look. 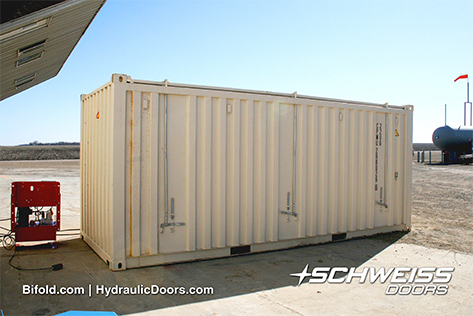 A hydraulic door on the end of the container operates with one hydraulic cylinder and has hinges with easy access grease zerks. It also has built-in walk door. 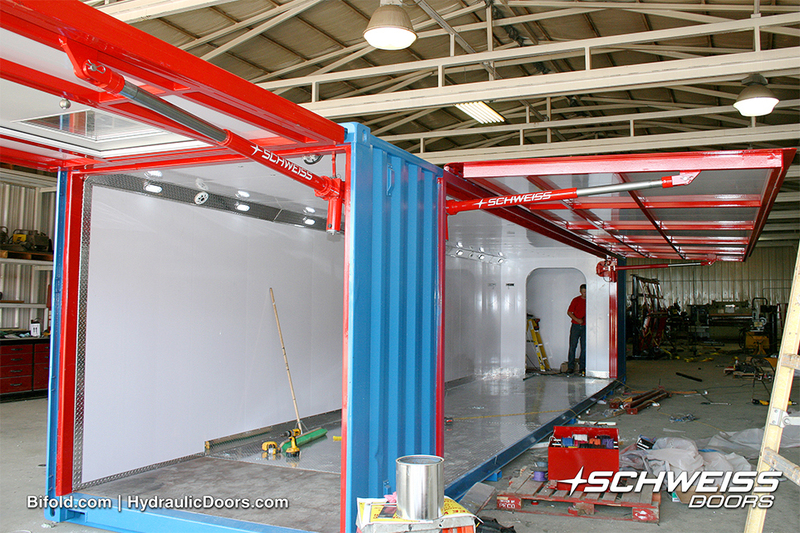 The containers can be designed with a small room at the end that can be used for storage, a small office or whatever. 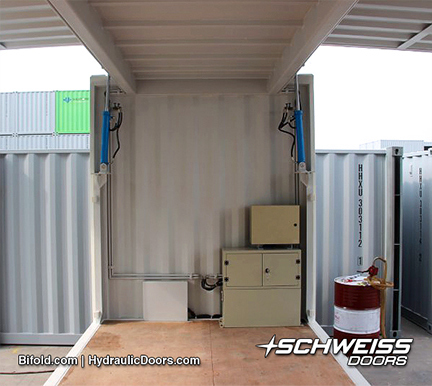 The interior of the container can be equipped with a speaker system and LED lighting, making it an ideal container for multiple uses. 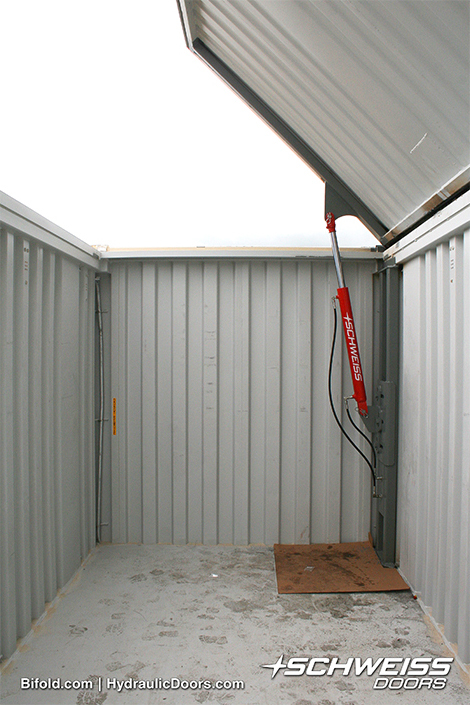 Should you desire to store this container where there is no access to electricity, the door can be manually run with a cordless drill or generator setup. 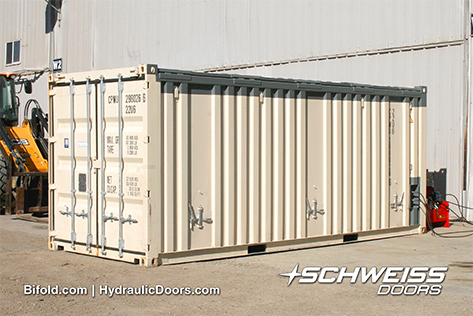 Container doors can be built up to 50 ft. in length and have a built-in support edge to prevent bowing. 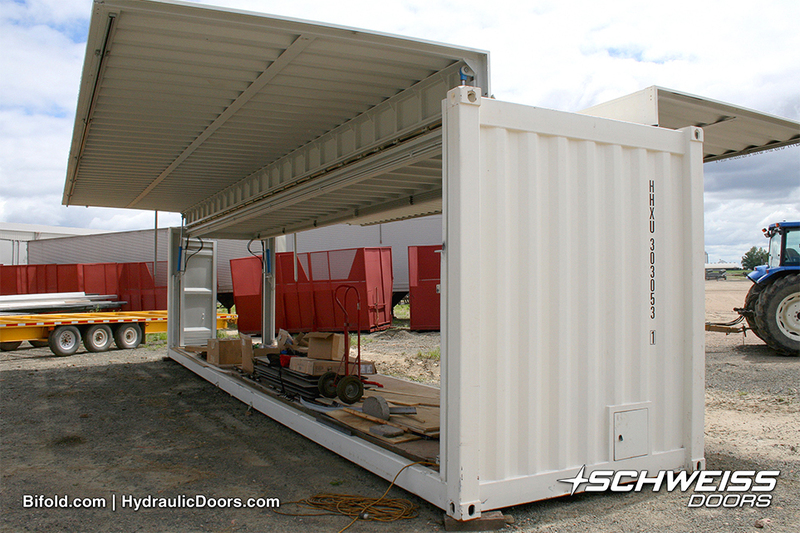 When the door is open it provides a nice shaded canopy and full access to the container from one end to the other. 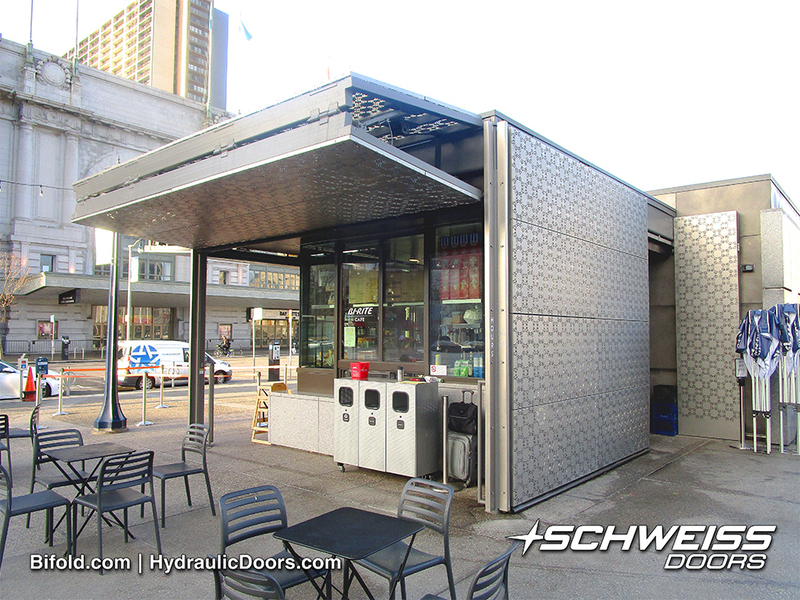 You can't get a cleaner look than this and with a large Schweiss Hydraulic Door you'll get the best access to your container. 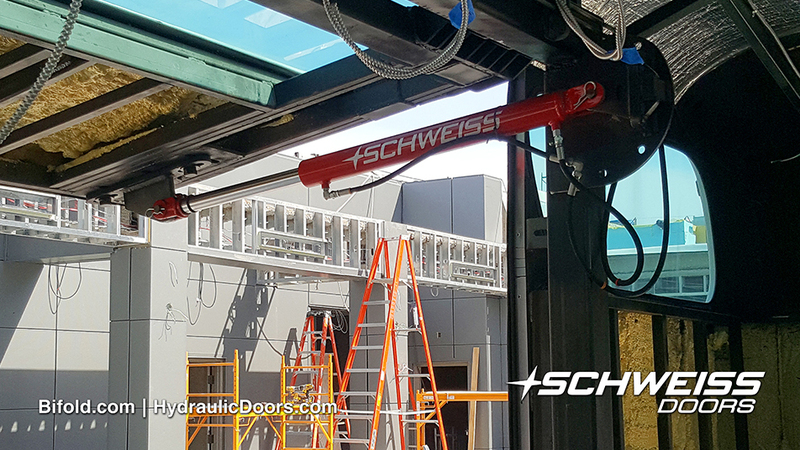 Door installation is made easy with a Telehandler. 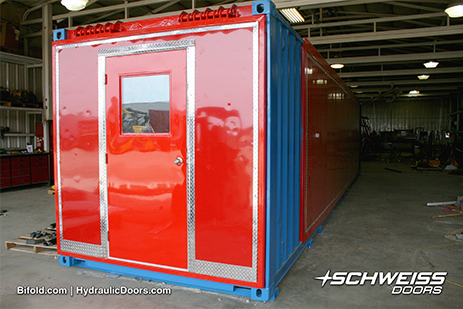 Doors are constructed with 2" x 2" strong steel tubing with a built-in truss system. 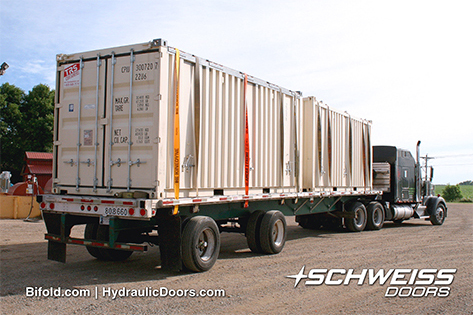 A walkdoor within a larger hydraulic door gives two ways of access into the container. 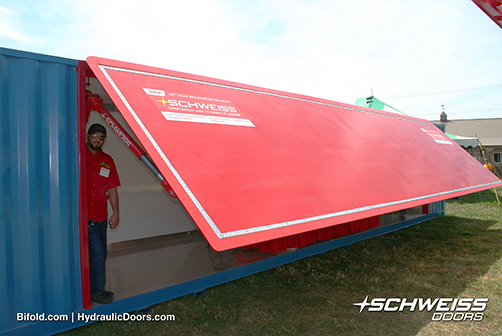 Walkdoors can be made with or without a window. All are custom-made to the customers needs and liking. 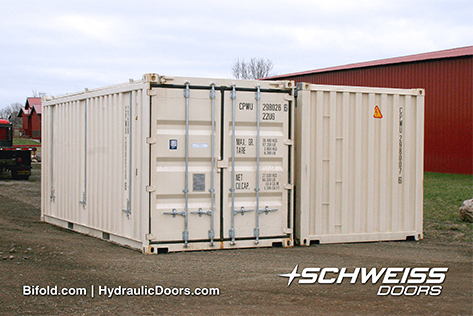 The clear openings on this custom-made 40 ft. container give it ultimate accessibility on the side and end. 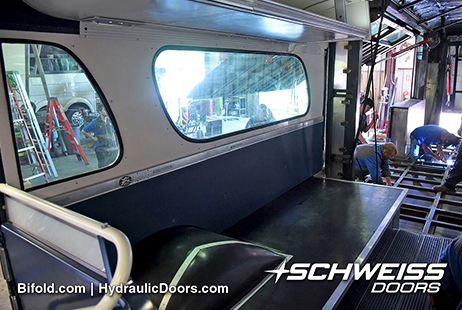 The large hydraulic end door has a 7 ft. x 3 ft walk door within the door. 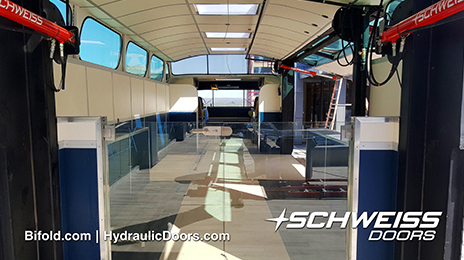 LED lighting, a stereo speaker system and aluminum diamond plate flooring can brighten up and customize the inside of your container. Whoever thought a container could look so good and be so functional? 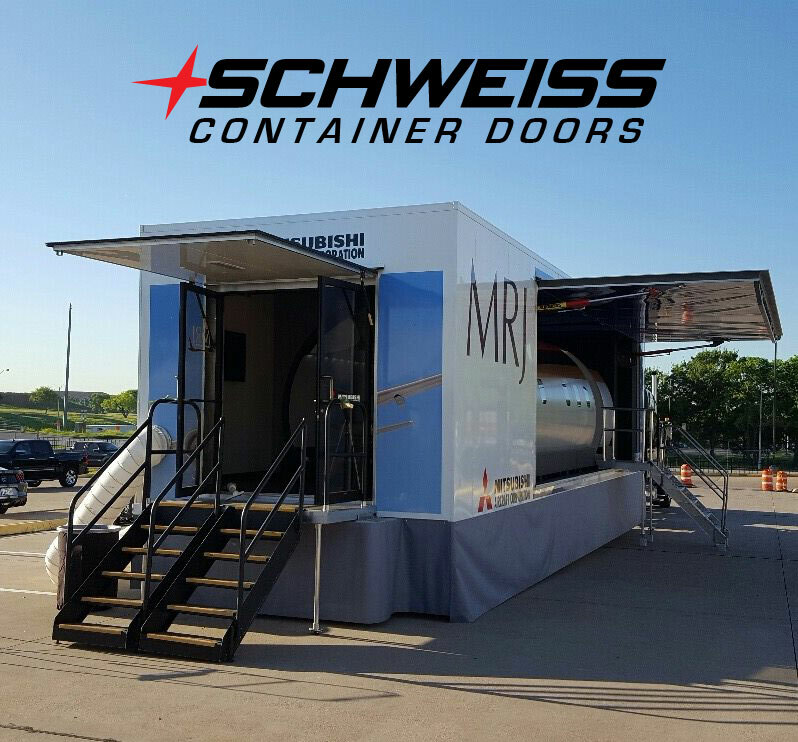 Schweiss Doors' new containers with easy access hydraulic doors on the side and ends are uncomparable in quality and craftsmanship. 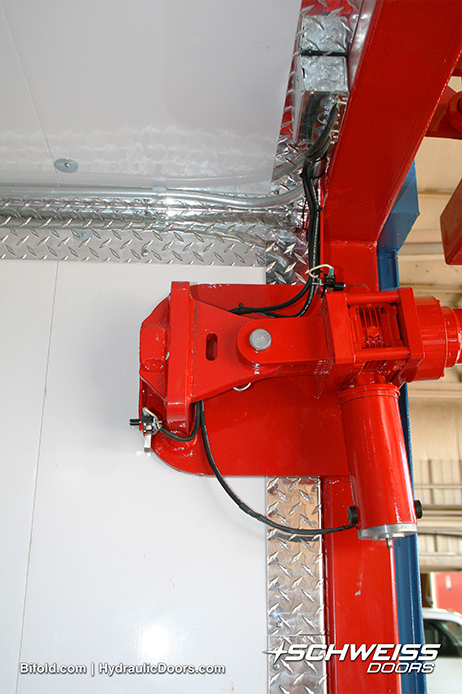 Attached to the top side of each specially designed container door cylinder, is a motor that is rated to lift 5,000 lbs from each cylinder and a ball screw actuator, the same type used on vehicle power steering units. 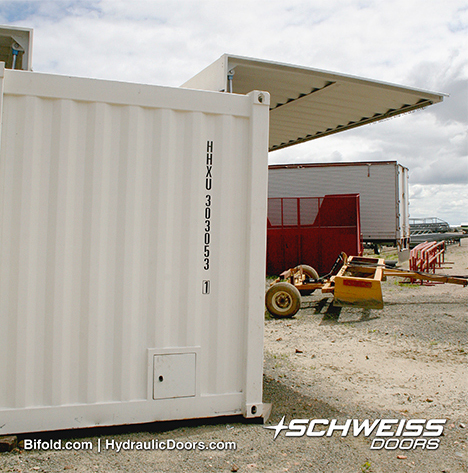 Schweiss Container Doors can be opened or closed quickly from the two-button control station or by remote opener. 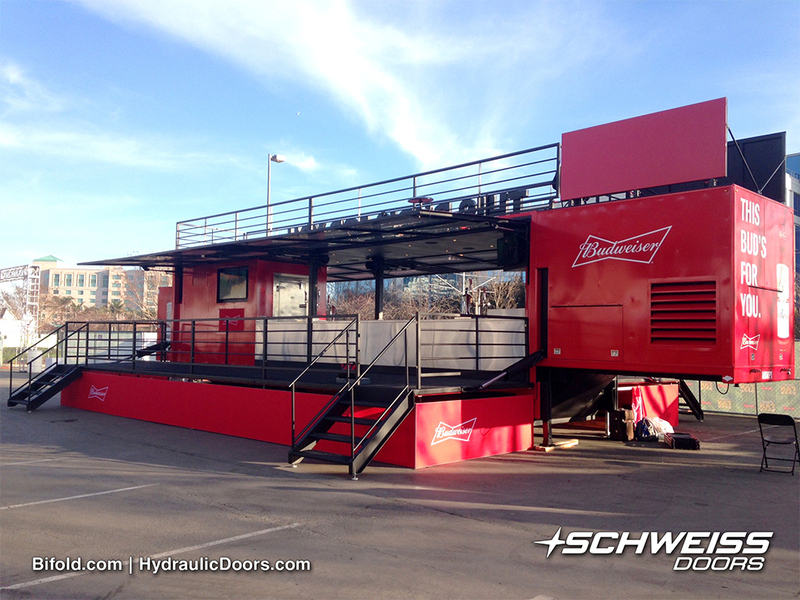 Live Nation, one of Raven Production Management Company's best clients, placed an order for 13 of these permanent container units similar to this one created for Budweiser. 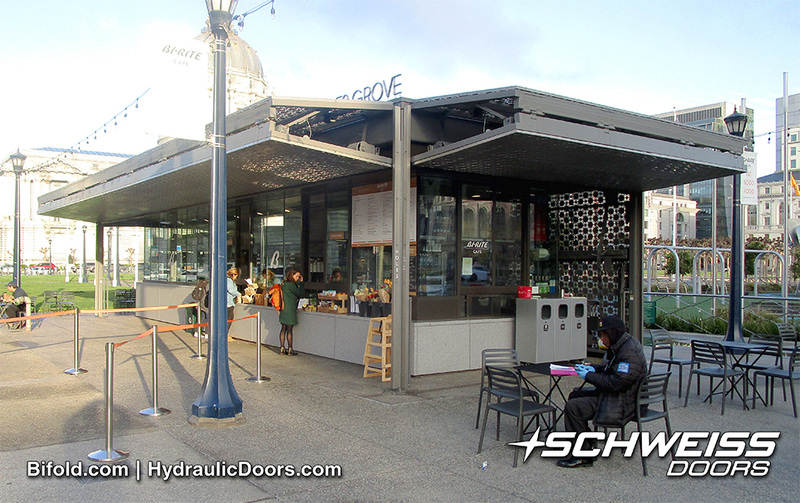 The units are 15' x 15' x 15' and have a Schweiss 13'3" x 7'2" bifold door at the main entrance. 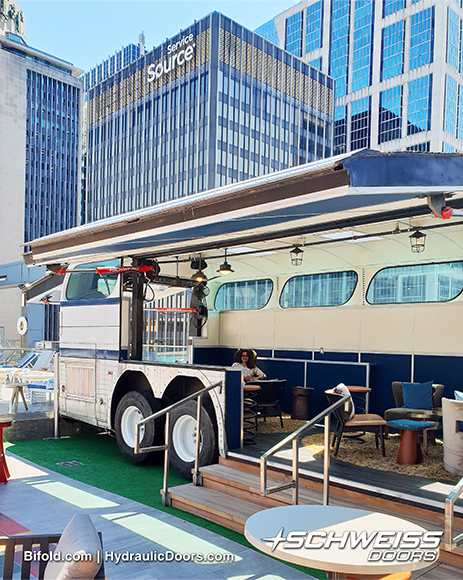 Live Nation will distribute event containers across the U.S.
Raven Production Management Company (PMG) of New Orleans constantly challenges itself to bring revolutionary production solutions to all of its clients. From the smallest nightclub events to entire festival sites Raven is there to tackle and enhance the experience with state of the art sound equipment, avant-garde lighting systems, and cutting edge video solutions. From basic stage arrangements to portable refreshment containers, multi-level risers and platforms, Raven excels at creating memorable experiences for patrons and artists. This team works hard to take your experience to the next level and is constantly outdoing itself across all fields of event production. 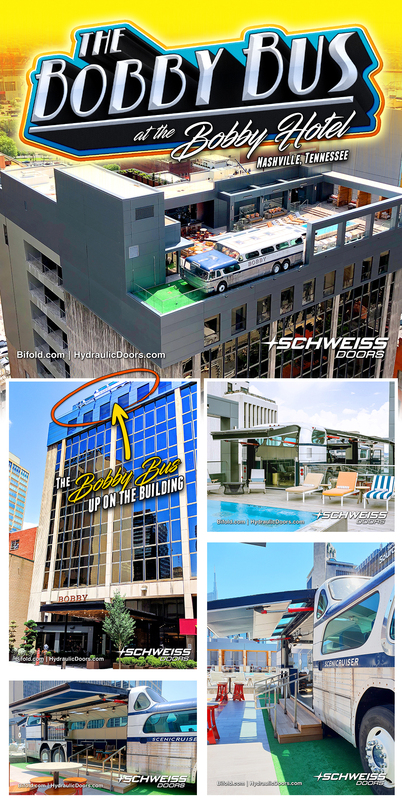 Their webpage photos alone bring to life what extraordinary talents this company can provide.. 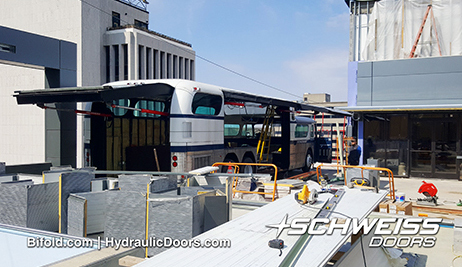 Adding to their repertoire of fantastic skills are the construction of arena and concert container units that will be in use at several events in the Los Angeles area and across the country. 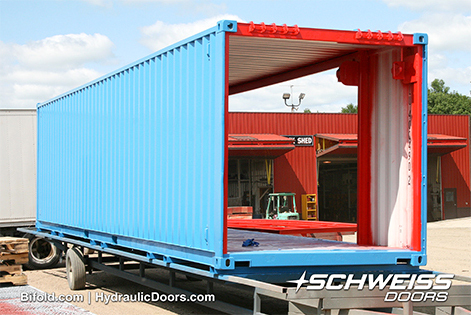 Raven PMG has ordered a total of 13 Schweiss bifold liftstrap doors for these container-building units. 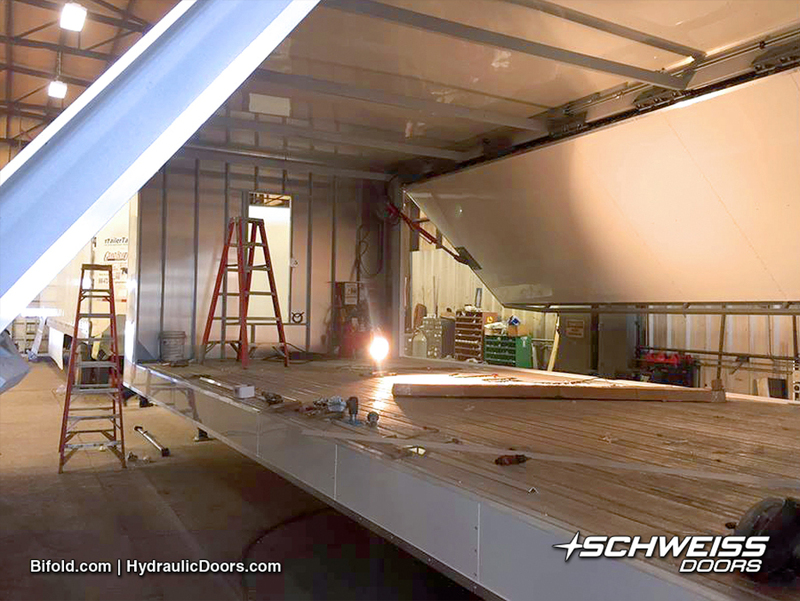 The custom-made doors are 13'3" x 7'2" with manual latches and have a 145 mph windload. They also have white liftstraps and the motors were painted white as well. 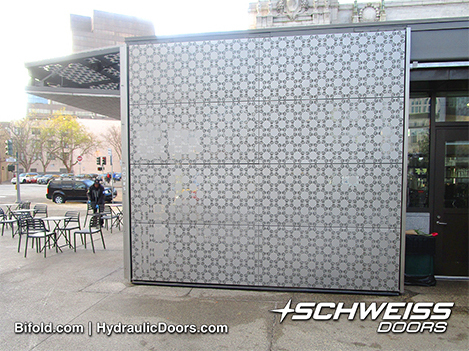 The outside of the bifold door was clad in ACM panel. 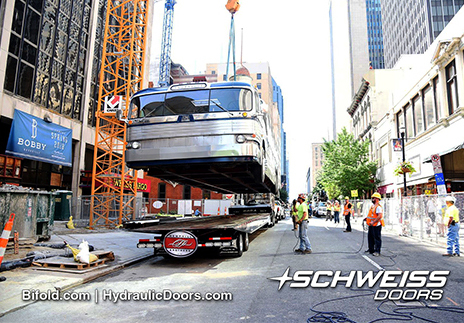 ACM provides a flat surface comparable to much thicker aluminum, at a more reasonable price. 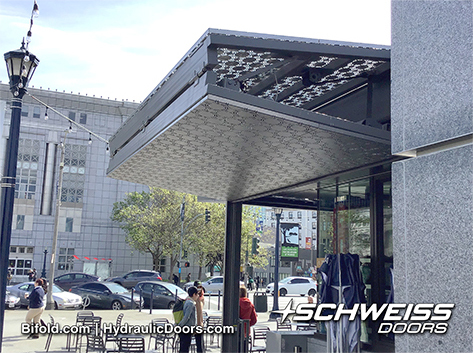 When you desire larger panel modules or panels with greater impact resistance, aluminum composite material is the way to go. 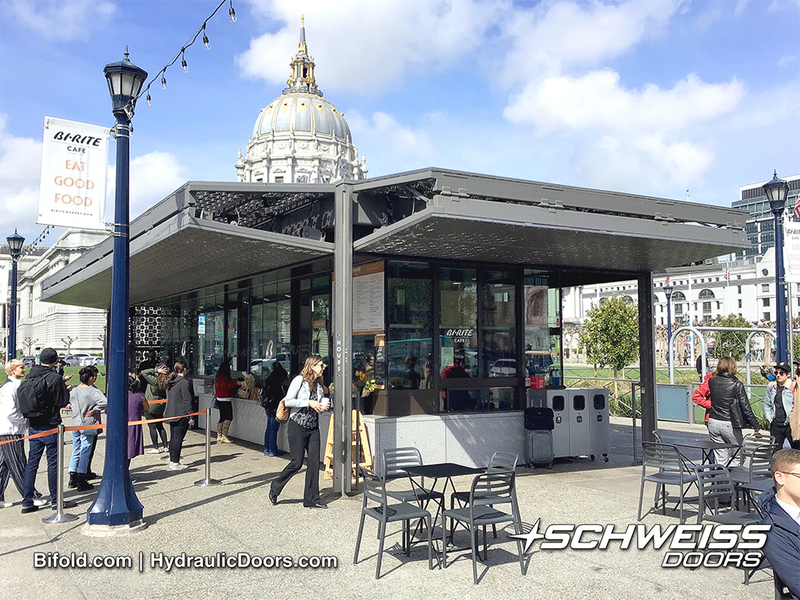 Describing them as containers is an understatement; these 15' x 15' x 15' permanent units are very versatile and are being used for much more than storage or as event food concession or portable product sales buildings. 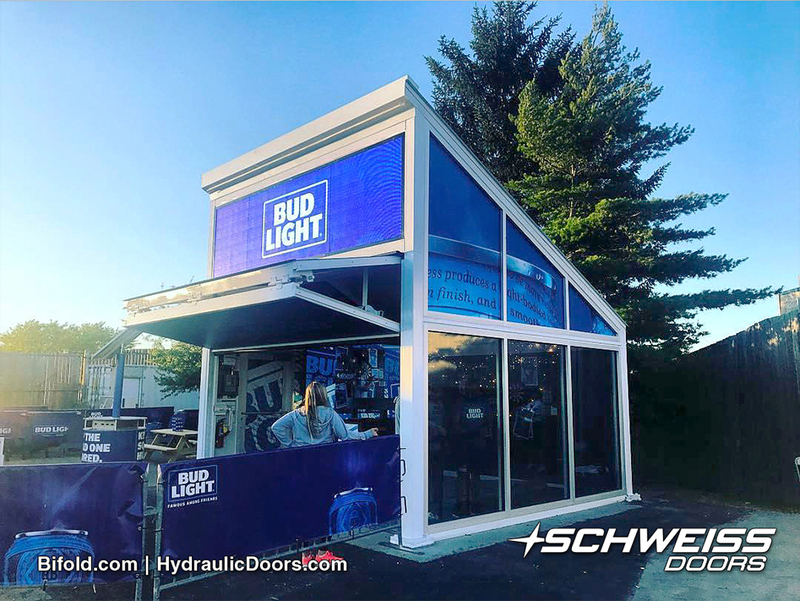 The unit designed for Bud Light has an interactive photo booth and alongside it is an area where people can enjoy a cold one. 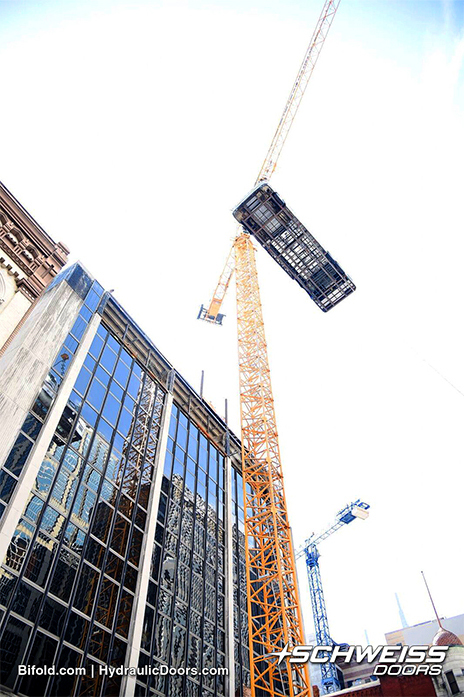 Raven PMG Partner, Chris Berends, said they operate out of one location in New Orleans, Louisiana, working with 12 full time employees and about 30 subcontractors. 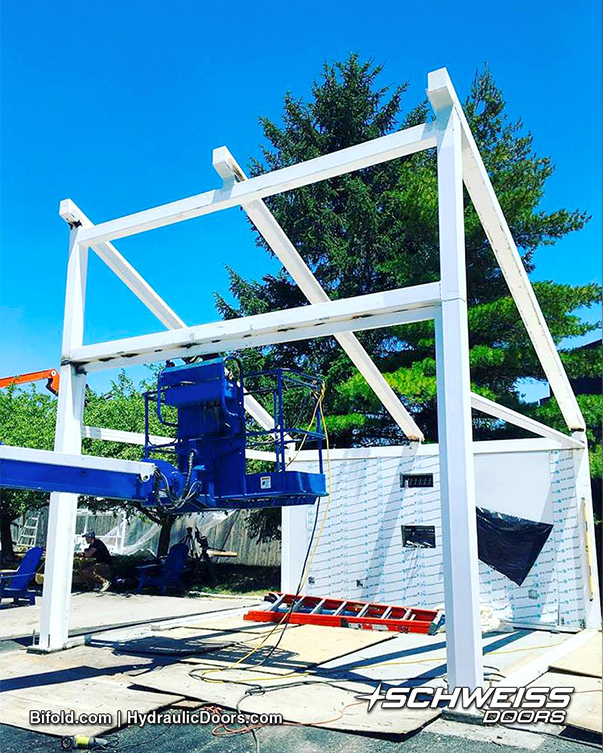 "Basically, we were contracted with Live Nation, one of our biggest clients, to build out 13 different sponsorship buildings for 13 of their amphitheaters. What Live Nation will in turn do is take those sponsorship buildings and try to sell or rent them to different sponsors. The first one that was rented out this amphitheater season was to Bud Light. This coming season, I'm hoping all of them will be rented out to 13 different sponsors permanently installed in 13 different locations. I know they've already locked in a couple sponsors for next season," said Berends. Live Nation Entertainment is an American global entertainment company, formed from the merger of Live Nation and Ticketmaster. It owns, leases, operates, has booking rights for and/or equity interests in a large number of U.S. entertainment venues. 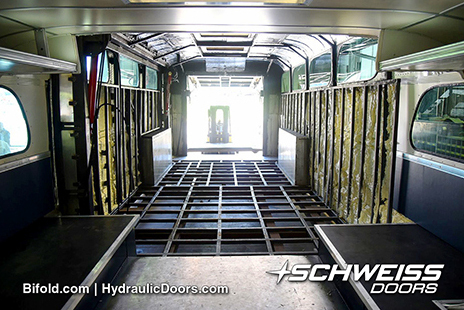 Steel framework was used to support the 13' wide bifold liftstrap door and to make these units as permanent and strong as possible to protect valuable equipment that may be stored within. 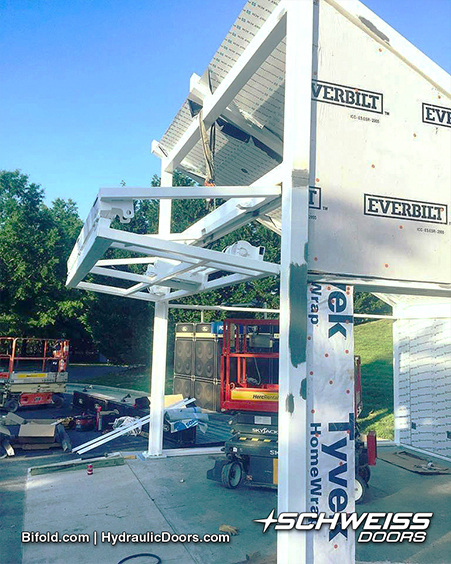 "This was pretty extraordinary in the fact that we prefabricated 13 buildings in our shop and deployed them to 13 locations throughout the U.S. 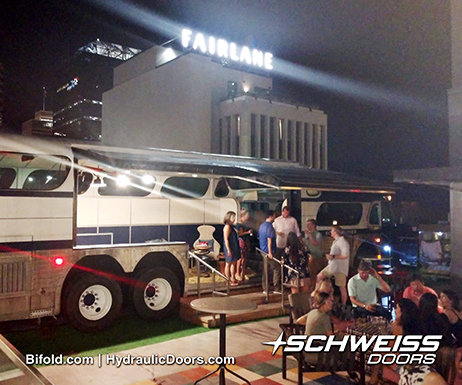 Normally we're an event fabrication company; we build a lot of structures for events that are temporary. 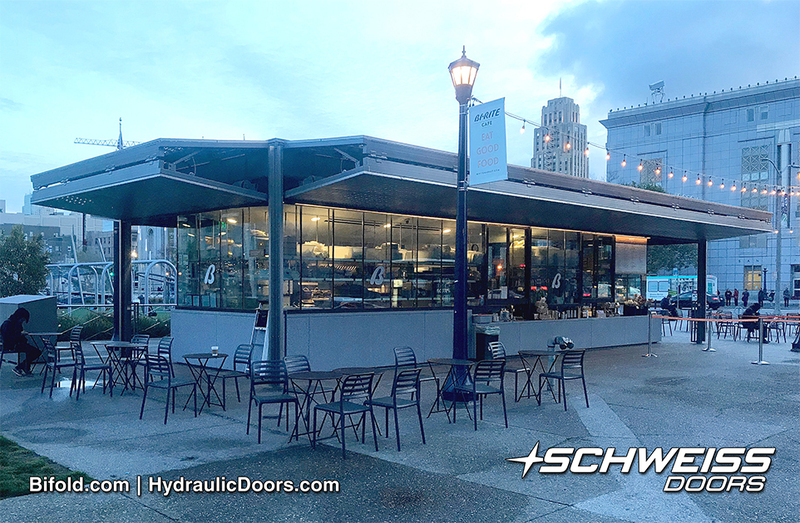 This involved a lot of the same methods and practices we use on a day-to-day basis for temporary structures like a video, wall, lighting and such," said Fabrication Director, William Nemitoff. 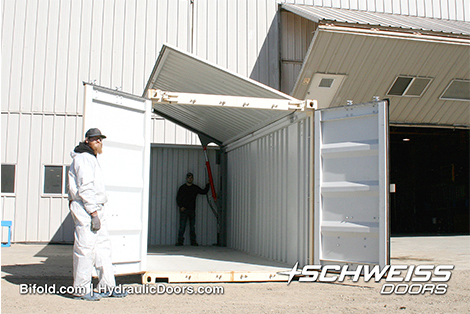 They discovered Schweiss Doors by perusing the Internet searching for different doors. 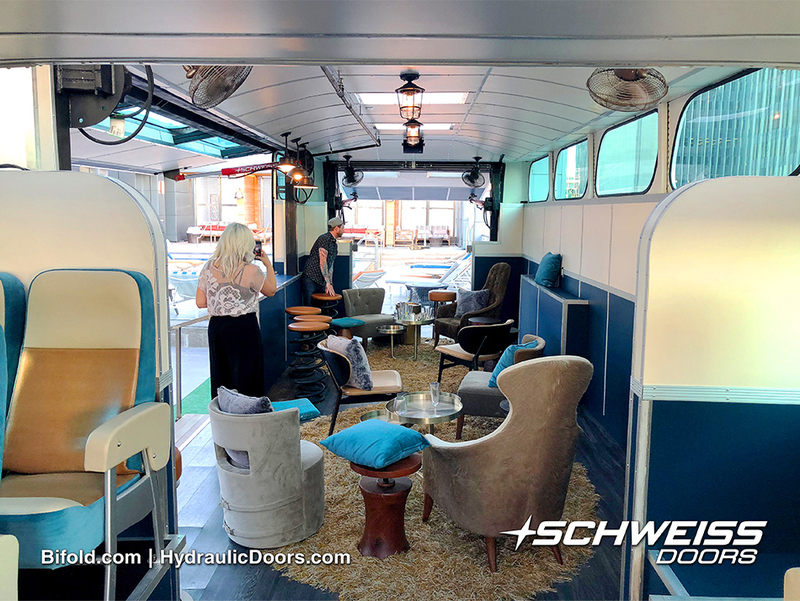 There was a Schweiss canopy style bifold door in Brooklyn, N.Y. that caught their attention on the Schweiss website, and that they thought would work well for this project. 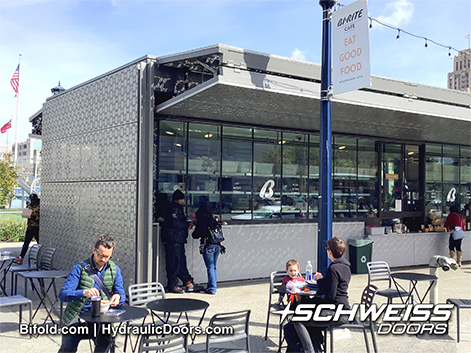 "It was from an aesthetic, design and quality standpoint that we went with Schweiss. 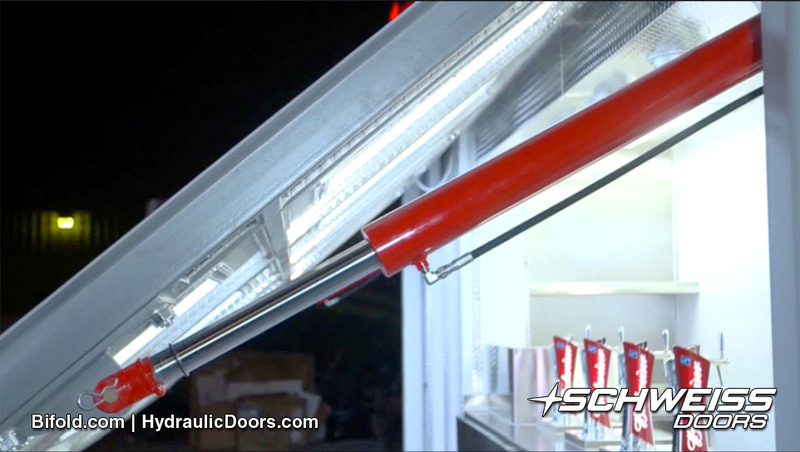 From the inside and the outside, when the door is in the up position, the motor is basically tucked into the door giving a minimal view of it; and the white straps and white motor added to the minimal look. 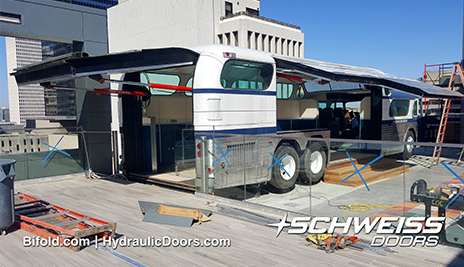 With a hydraulic door you would see the hydraulic arms from the outside. You've got the safety and the electronics figured out. I really appreciate all the safety decals and manuals," noted Nemitoff. 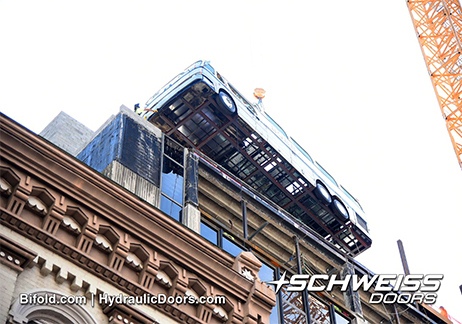 One wall is glass; other walls are R-Panel construction. The rear wall has an air conditioning unit and electrical panel on it. 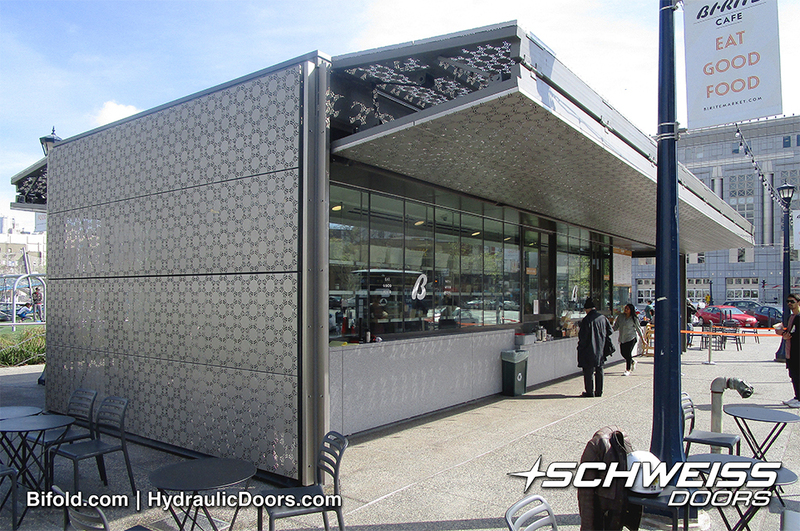 The front wall above the bifold door has a 5-millimeter video wall above it. 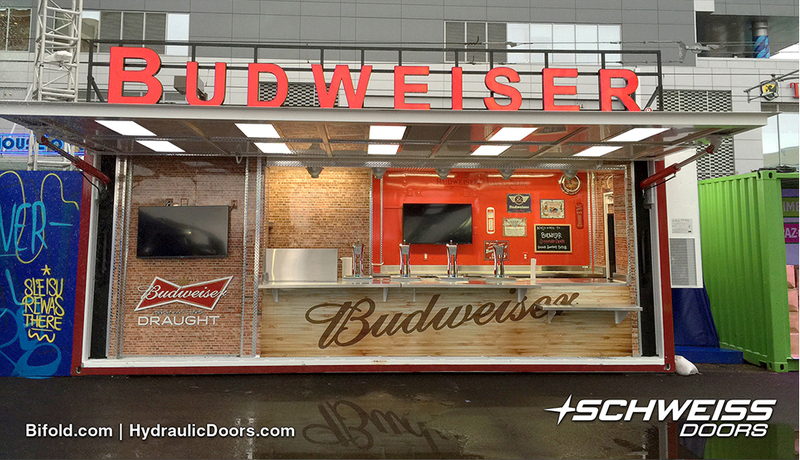 "Budweiser used it for brand activation - they turned it into a dynamic photo booth that creates a GIF, basically it's like an array of cameras that takes sequential photos, so you get a moving image. The technology blends these photos into one moving image. It's more for promotion of a brand than for selling anything, but it could be used for sales purposes," explained Nemitoff. 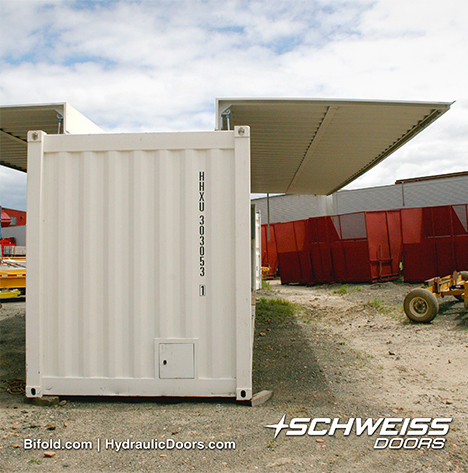 "The focus of the containers is to make them as flexible as possible with ample power inside them. 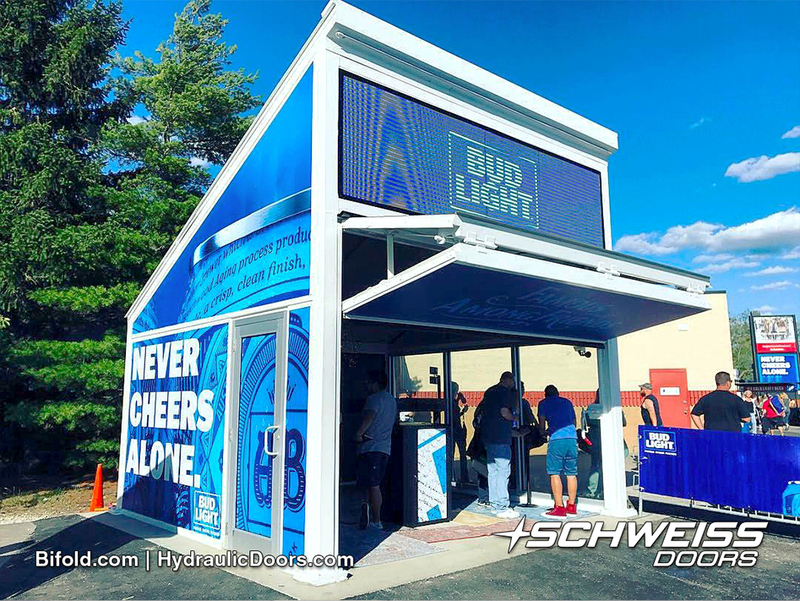 For instance, Bud Light brought in a 360-degree camera that had special requirements. We put in a hardline Internet connection and all the lighting up above can be replaced with whatever fixtures the client may want. "One of the things we did for Live Nation was design a bunch of different strategies for using the containers. We did designs for what it would look like if it were a rock n' roll cafe, a virtual reality location and another was a karaoke bar. Basically something Live Nation could use to make it appealing to their clients," noted Berends. With over 10 years of experience, Raven is happy to work with clients in any capacity, from rental all the way to turnkey production management. Raven fabrication is what separates Raven PMG from the pack. A team of mad scientists works around the clock to bring the most farfetched ideas to life using cutting edge technology and battle-tested methods. This laboratory is the heart of Raven and leaps at the opportunity to explore and invent. Innovation is key to a successful event and with each new idea comes a new set of challenges that is the fuel that drives Raven. 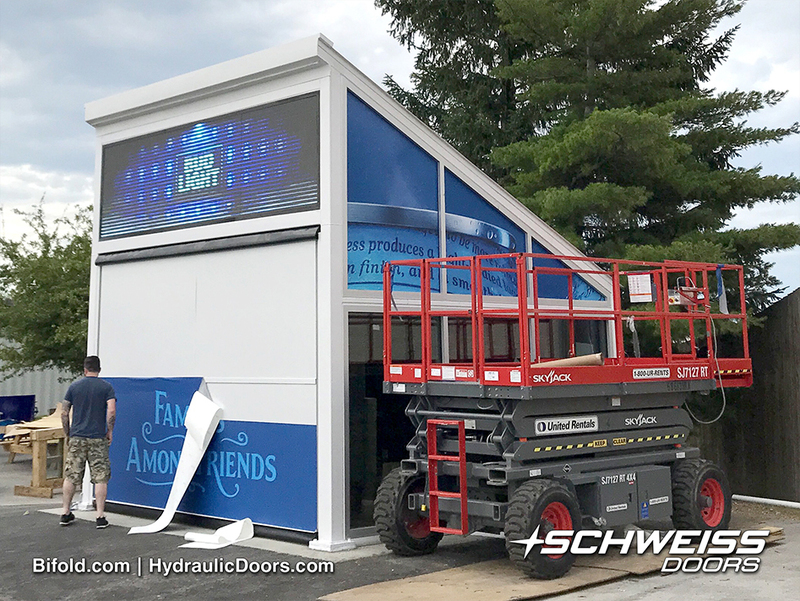 Raven PMG prefabricated 13 buildings in their shop and deployed them to 13 locations throughout the U.S. As an event fabrication company they normally build a lot of structures for events that are temporary, these are permanent units that can serve many purposes from brand promotion to food and product locations. Raven PMG is capable of providing all types of event services, from conceptual to realization. 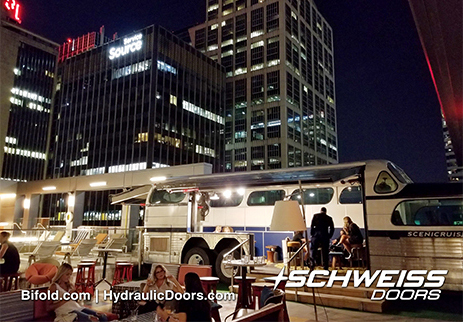 Their quickly growing team with tried-and-true methods and superior quality craftsmanship has provided immersive experiences for organizations in every corner of the entertainment industry from professional sports teams and touring artists to nationally recognized music festivals, brands and venues. The Nest team began as a group of structural artists seeking to produce large scale installations and activations that pushed the boundaries of possibility and interaction. Each new idea, from clients or teammates, is a challenge. Because of this competition Nest is also able to curate assemblies of the best installation artists in the world for any event. 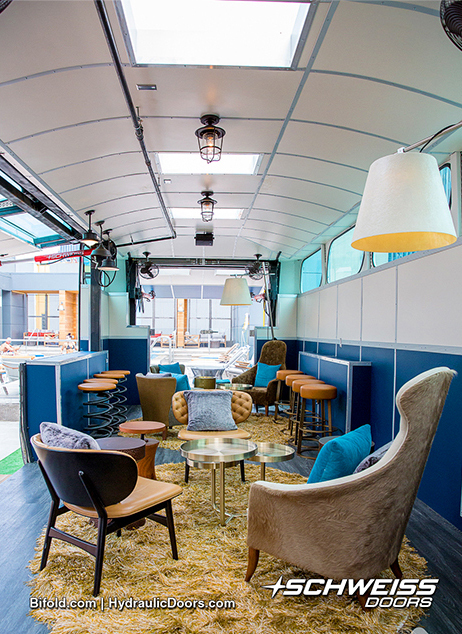 A staff of internationally recognized production designers, architects, and fabricators work together to make even the most far-fetched ideas effective realities within the entertainment industry. From site analysis to layout and execution, Nest site designs embellish the most defining characteristics of a site while maintaining a skeptical eye for safety. Safety takes priority in everything designed by Nest and executed by Raven. 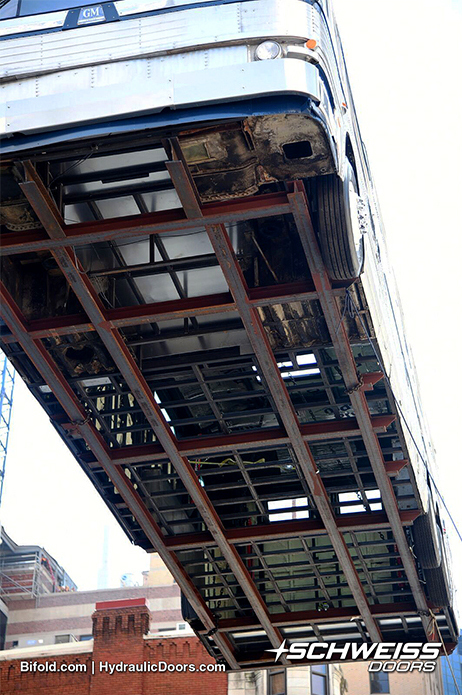 This team works tirelessly to ensure its safety with advanced software analysis, physical load testing, and licensed engineering reports. Using Computer Numerical Control Raven Fabrication is able to construct with ultimate precision. 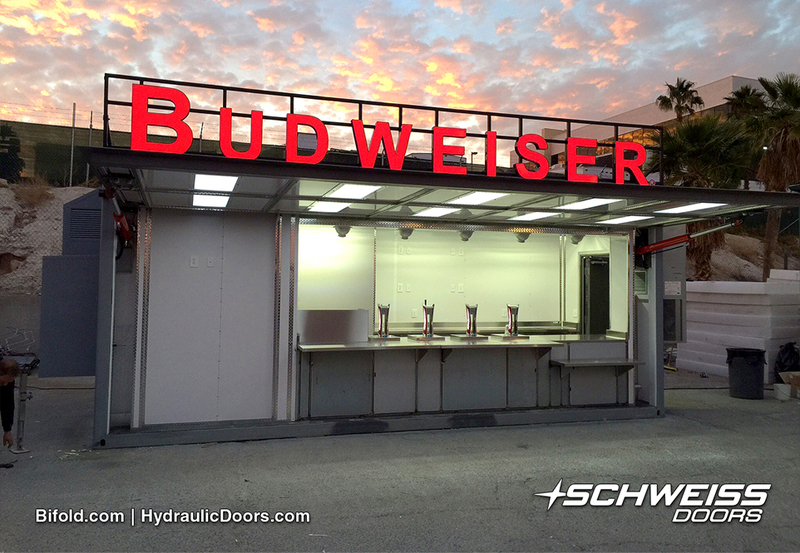 From custom case assembly to large-scale installations the scope of services is endless. Raven Fabrication's understanding of thresholds, material properties, and tool paths allows it to push the boundary of CNC aided design. 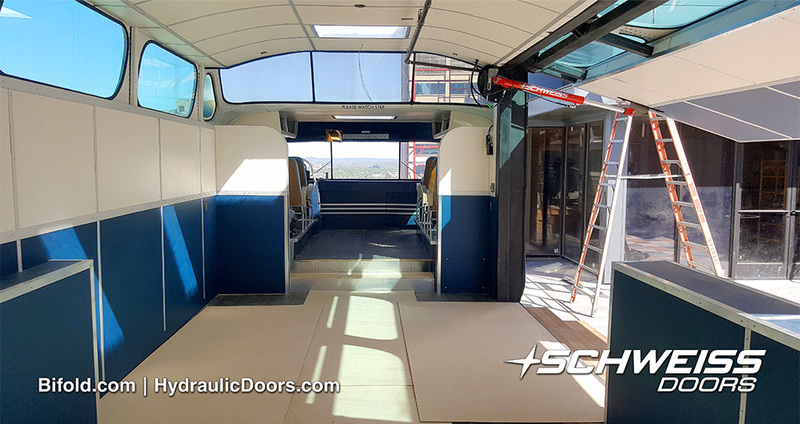 With the bifold doorframe attached, it is now ready for the liftstraps and other essentials to be put in place. 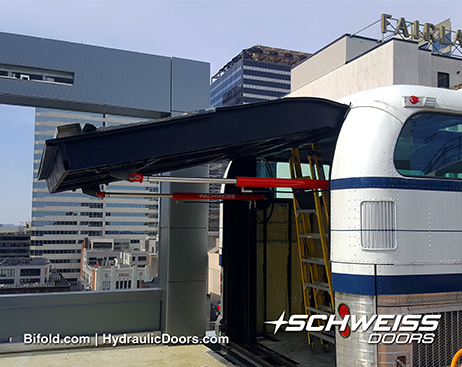 To give the Budweiser unit a cleaner look, the doorframe and motor were painted white and white liftstraps were specially ordered. Raven Fabrication utilizes three-dimensional molds created by CNC or 3D printers to rapidly deploy highly precise custom parts, and can visualize and create virtually anything. Coupling this with an advanced thermoforming system creates endless opportunity for high volume custom manufacturing for use in lighting, decor, art, and staging. Raven Fabrication specializes in AV and Lighting installations and uses advanced technology to produce custom solutions to fit any venue or event application. This also applies for large scale special effects like pneumatic, pyrotechnic, and other high-pressure systems. State of the art audio systems controlled by the best audio technicians in the business can be created at a clients' request. Special effects such as lasers, cryogenics, pyro, confetti, or whatever the effect, Raven is there, eagerly awaiting to pop it off. Raven began as a lighting company and has one of the largest lighting inventories in New Orleans. From projectors to high-resolution video walls Raven constantly pushes the boundaries of video applications through custom fabrication and interactive media. With a keen eye for detail, Raven's camera operators and content editors can create content from scratch for any application. 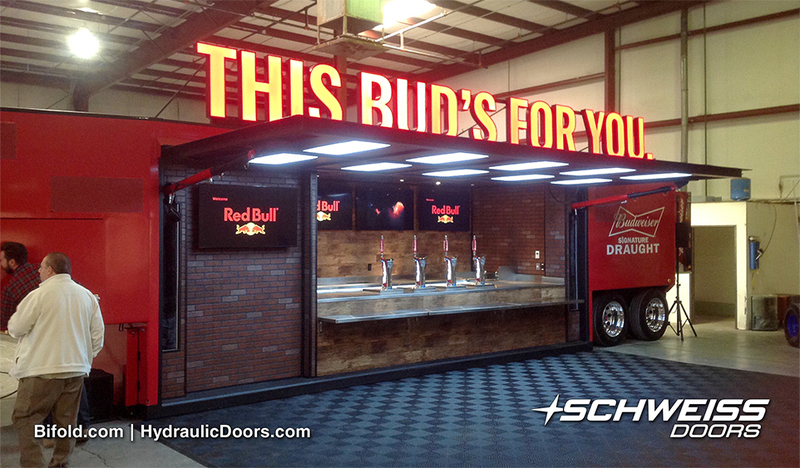 Upon entering the finished Budweiser event container this person checks out the interactive photo booth. Raven can customize units such as these to include special camera, lighting and audio installations and uses advanced technology to produce custom solutions to fit any venue or event application.